Leader vs Manager is perhaps a debate that's as old as the history of modern business organization. Both of these terms are somewhat nebulous with many definitions. This article starts with a simple self-assessment that helps you determine whether you are predominantly a leader or a manager. Next, it defines what leadership and management are and compares and contrasts their traits, characteristics and qualities. It also provides some resources for further exploration, study and reference. A word of caution: It's wrongly assumed by many that leaders are somehow "better" than managers or that managers should try to be leaders. Both have their value in the world. Please make sure that you answer the questions with brutal honesty with yourself. The best place to start reading this article is to take the simple assessment below. In my experience in working with leaders and managers, I have found that most people are predisposed from their early childhood, maybe even from birth, to be either a leader or a manager. That's not to say that a person can't acquire the skills to be one or the other, only that to most people one is more natural than the other. This is why a person would be naturally attracted to either being a manager or a leader. Following are some traits and qualities that make leaders and managers predisposed to be one or the other. "Are We in the Right Jungle?" Leaders and managers share six things in common. They differ, however, in how they deal with those six things. Both leaders and managers work with people. However, for a leader, people are the reason, the cause for whom an endeavor is taken on, a vision attained or a project completed. For a manager, people are primarily a means to achieve a significant achievement, accomplishing an important task or completing a project. Both managers and leaders understand that there is a collective condition, a Reality, that's unacceptable to a group of people. A leader's intention, however, is to help those people believe in the Vision of a solution to their Reality. The manager's intention is to motivate them on a gradual path to a Vision. People often form a Vision of how they want things to be, which is important to both leaders and managers. Leaders help people forge a shared vision that they believe in and communicate it back to them to get their agreement. Managers help people make that Vision actionable by breaking it down in incremental goals, projects and tasks and providing the necessary resources for moving forward in the direction of the Vision. The gap between the Reality and the Vision, also known as Cognitive Dissonance in psychology, gives rise to an endeavor. Leaders use Cognitive Dissonance to help people carve out a path from Reality to Vision that they can believe in. Managers use Cognitive Dissonance to help people take specific action steps on a specific path. Both leaders and managers understand that people need to choose a common path to go from their Reality to their Vision. Once the path is chosen, leaders make certain that people remain on the right path to the right Vision. Managers, however, make sure that their progress on that path is pursued efficiently - as quickly as possible and at the minimum expenditure of resources. People often share a sense of mission or purpose that transcends the avoidance of Reality and achieving of a Vision. Both leaders and managers make use of Higher Purpose. Leaders bring out the best in people, their higher angels, so they will give their whole beings to the achievement of the Vision. Managers tap into people's higher purpose and transform it into a selfless sense of persistence, endurance and perseverance. Agree or Disagree? "...most people are predisposed from their early childhood, maybe even from birth, to be either a leader or a manager." 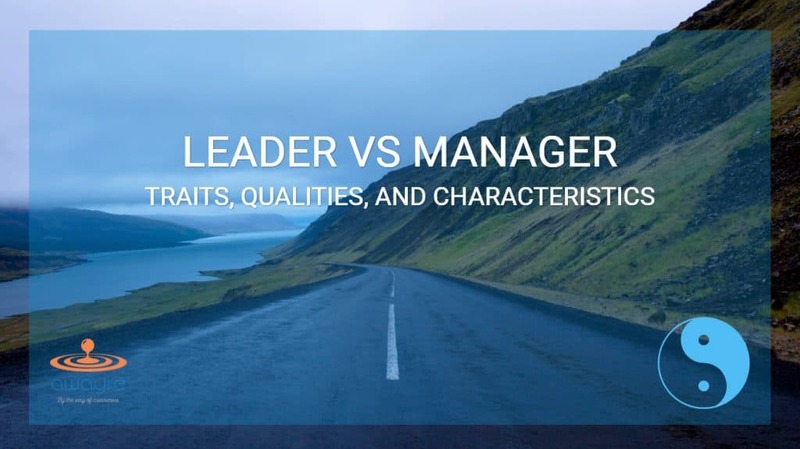 Which Trait, Quality, or Characteristic Defines You as a Leader or a Manager? Do you agree with your assessment as a leader or a manager? Is there a trait or a quality in you that identifies you as a leader or a manager? Please share in the comments section below one quality that defines you as either a leader or a manager. More importantly, tell us one insight you are taking away with you from this article (and from the quiz) about being a leader versus being a manager.